This Armadillo cake was made for a man who works with my husband. His wife asked me to make it for him for a surprise. This was a first for me. I have never made and Armadillo cake before. I think it turned out really cool. This cake is made out of three Red Velvet Cake Mixes. I do not use fondant. 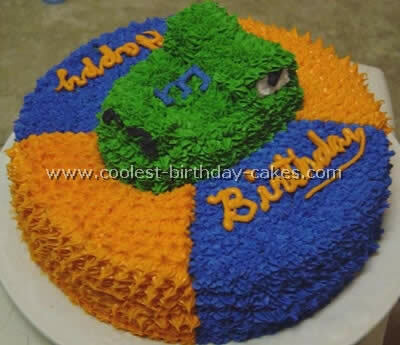 This cake is made out of Butter Cream icing. His ears are made out of Royal Icing made a few days ahead. To begin I put pieces of wax paper down on the board. These will later need to be removed. 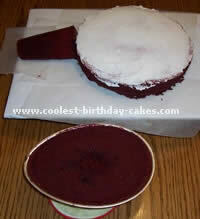 Since this cake has to be formed (cut) I knew that the red cake mix would make a mess on the board. The wax paper will prevent that. I cooked a round one mix cake for the bottom of the body. I have a 3D Panda Cake Pan. I used the Core that goes inside the panda pan for the head. I used the 3D Egg Cake Pan for the upper body (two halves). (Tip: To remove the cakes from pans! An elderly friend who did wedding cakes told me this. It works great; spray the bottom of your cake pan. Cut a paper towel or napkin to fit the bottom of your pan. I do this by sitting the pan on top of the paper, draw it, cut it. Lay the paper towel on top of the oil. Pour your mixed batter on top of the paper towel and bake. After baking let your cake cool. 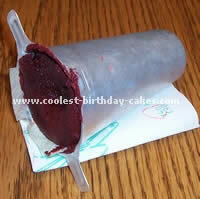 Take a butter knife around the edges flip you cake out on the board and peel the paper off. It’s that simple. I’ve been doing this for 16 years. Do not let the paper towel go up the edges, just the bottom). For the core (head of the Armadillo) I did put a piece of towel on the inside bottom and pieces down the edges. It came right out! I did put a dowel rod into his head to connect to the body and dowel down through each egg cake into the body so that nothing shifted. I made this Armadillo cake for a 50th birthday. This cake is an old favorite sometimes seen (more often in the South) as Groom’s cakes. Complete with red velvet cake for a shocker when you serve it up! I used the Wilton football pan for the shell and body- placed on a cardboard platform to elevate the body. Then the feet were small cupcakes. 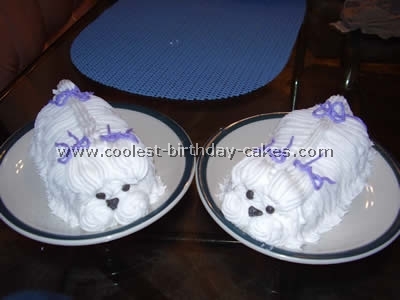 For the head and tail I used foil to create the basic shape so I could bake them separately. For the icing I chose a brownish color (armadillos are gray to brown colored) and smooth-iced the whole thing. I went back with the largest ribbon tip I had to create the ridges of the shell. The ears and the claws are the same ribbon tip. The eyes were some chocolate candies I had on hand.